I always find it humorous to watch which character traits Senia Mae has taken from me and what she has picked up from Kim. If any of you know us personally, you probably know that Kim is the clean freak and I am the sentimental storer/pile maker. 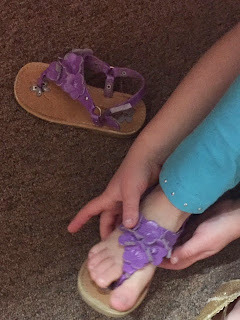 Today's background squabble of the day was Kim threatening to vacuum up Senia Mae's Barbie shoes that she haphazardly shoved under the bookshelf when asked to clean up her mess. Okay, that would be a Kara trait she picked up. The house was suddenly loud with the whirr of the vacuum as Kim pulled out the shelf and Senia Mae pleaded in the background, "No, no, those mean something to me," running up to the shelf and scooping the shoes up in a hurry. "Well a clean house means something to me," Kim replied. On goes the daily battle of what stays and what goes. Sometimes it is even so tough that we have to go through Senia Mae's clothes and old toys when she's at school. Several weeks ago, after the Christmas surplus, we made a quick deposit at the Abba House thrift store about a mile down the road. I have thought nothing of it since then. A few days ago I wanted to drop off an old office chair as Senia Mae and I were running errands. "Can we go inside?" she asked. "I want to see the fish and the waterfall." "Ok," I said, wanting to see how many steps I would get walking around the thrift store with my new Fitbit. The thrift store resides in a now defunct outdoor sportsman's shop, so the inside is sanded pine and very rustic, with a flowing waterfall that collects into an indoor coy pool. Senia Mae thinks it is totally awesome because there is a walking bridge over a narrow section of the pool. Right behind the coy pond is the used treadmill and lawnmower section that I was eying as Senia Mae stared into the continuous ebb below. "Mama, can we go see the toys?" "Sure," I said without thinking. Then I spotted the half broken Barbie house we had donated the week before. Maybe she wouldn't notice. "Look, Mama, this looks just like mine," Senia Mae said as I guided her past the other Barbie houses to the clothes rack. She immediately gravitated towards the shoes, another Kara trait, and sat down, pulling a pair of purple Laura Ashley flowered sandals off the shelf. "I just love these, they look just like the ones I have." "Had," I whispered under my breath, hoping I wasn't going to have to purchase something I had already donated. That is the problem with shopping and donating to the same store. You never know when you might just have to buy your own stuff back in order to save face. "Senia Mae, those are really too small," I said. "They won't fit in the summer time. We have another pair at home that is a little bit bigger." Fortunately for me she agreed and we headed on to the next aisle. Whew. That one could have gone either way!